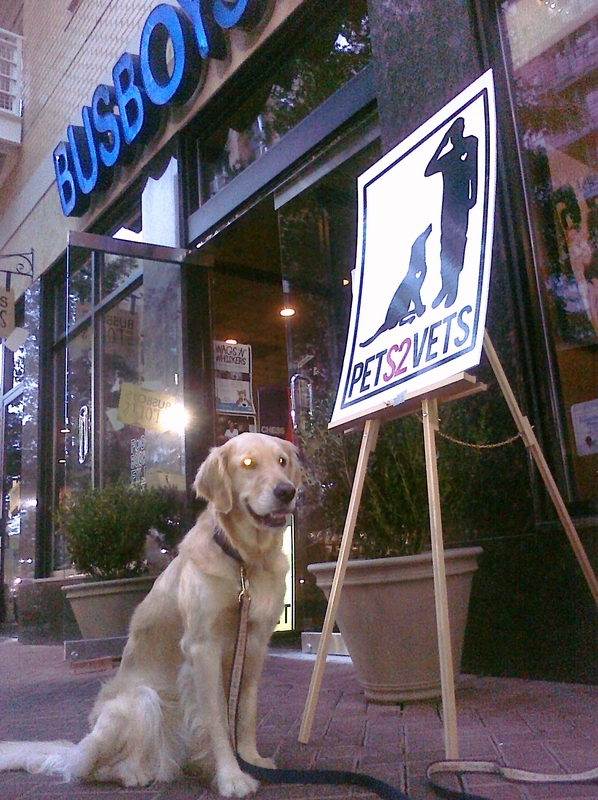 Chatham, Sundae and I went to Shirlington Village last night for the Busboys & Poets Nonprofit Tuesdays to benefit PETS2VETS. The group had big signs out front of the restaurant as well as inside, which drew a lot of attention. Dogs weren’t allowed in the restaurant, but we enjoyed a delicious crab cake sandwich at an outdoor table. One special dog was greeting diners inside, though. Cheyenne, a 9-year old pit bull rescue was there with her owner P2V founder and Air Force Security Forces veteran Dave Sharpe. Cheyenne is the inspiration for the nonprofit, see the Aug. 21 post. Dave chatted with customers and looked on proudly as Cheyenne made friends with both children and adults. Rebecca with P2V said that while many diners didn’t know about the event, a lot had asked about the organization, donated money and signed up to receive their newsletter. Cheyenne, Dave and other P2V representatives will be at Fort Belvoir’s Pooch Plunge this Saturday. I love the blog! It’s so much fun to read about all the happening events available to dog lovers in the Washington, DC-metro area. You are a prolific poster, and I look forward to receiving them.